Monday’s meeting had a lively and informative Open Forum during which many of the 116 parishioners present expressed their views about the planning application for the field adjacent to the Village Hall. The Parish Council was given invaluable feedback and observations. In attendance were Phil Hardy (District Councillor) and Colin Foulger (County Councillor). Prior to the meeting the EDP carried the story. This was followed by an update at the close of the meeting. Never before have I seen such long queues waiting to attend a Parish Council meeting! As the hall filled, the Parish Council took up position on the stage in order that parishioners could see and hear clearly. A show of hands indicated full support to oppose the application. Parishioners had clearly shown they wanted the Parish Council to register an objection with South Norfolk. People reported difficulties using the SNC planning site when trying to register their comments: they ran out of time; lost their work; were unable to complete registration; etc. 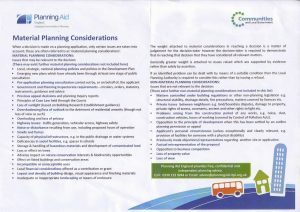 With this in mind, the District Councillor has arranged for the consultation closure date to be put back to 24th August. For those concerned about their names and address being made public, Councillor Hardy invited them to email their comments to him. He will collate them for inclusion in his Councillor’s report. 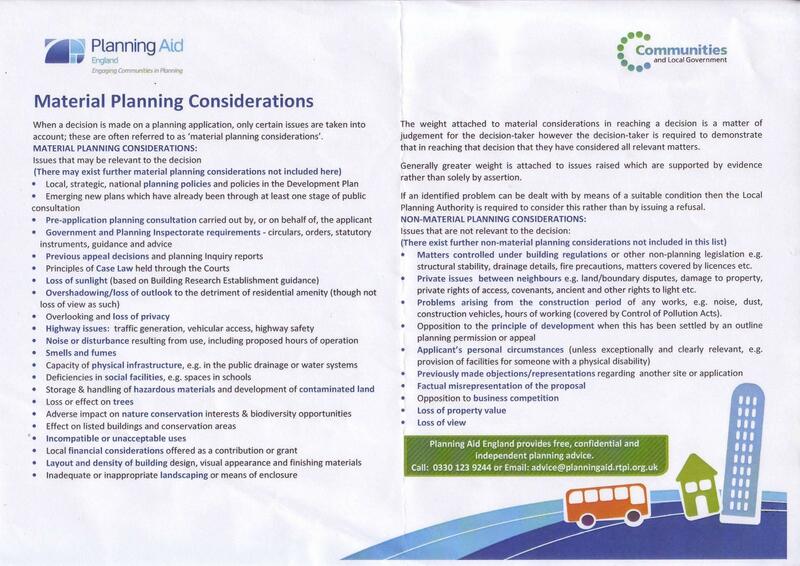 I must emphasise that this does not carry the same weight as individual comments to South Norfolk Planning. Before the meeting, I had taken informal legal advice which recommended delaying any legal intervention until the planners had made their recommendation. The Parish Council may then instruct a solicitor. Two thirds of parishioners expressed support for a separate legal approach sourced and funded by themselves. I need to stress that the main message, underlined by Colin Foulger, is that comments must be objective, factual and address material considerations, as explained in the image below. Colin makes it clear that if people ensure sufficient comments are made then there is a very good chance that we will win. Finally, I wish to thank all who attended for their positive approach and working with me as the Chair to ensure the meeting met its objectives. And, thank you to those who helped to clear away the tables and chairs.